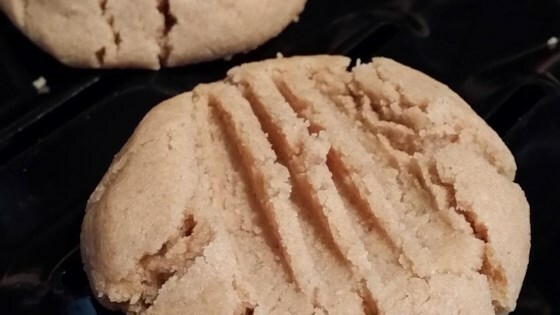 "A healthy, gluten free version of perfect peanut butter cookies." In a medium bowl, cream together the margarine, brown sugar and white sugar until smooth. Mix in the egg and peanut butter. Combine the baking soda, soy flour, tapioca flour and potato flour; stir into the batter to form a dough. Roll teaspoonfuls of dough into balls and place them 2 inches apart onto ungreased baking sheets. This is the best GF cookie I have had yet. The only problem is, the rest of my familly eat them instead of the flour versions and I have to constantly bake more. THANKS for this great recipe! Absolutely delightful! I followed the recipe except I substituted King Arthur flour gluten free multi purpose flour instead of all the flours listed and they turned out great! These were awesome! I've made them with teff flour in place of the potato flour, and I've also made them with almond butter too! Just delicious! Great! Didn't have soy flour so substituted brown rice. Worked out fine. It is so hard to find gluten free alternatives that are not soo costly. This recipe is great! Tastes almost like the real thing. Thank you for sharing!